Aortic valve stenosis (AVS) is the functional narrowing of the orifice of the aortic valve and causes obstruction to blood flow from the left ventricle (LV) to the systemic circulation. The image below shows the left ventricular outflow tract and aortic valve. 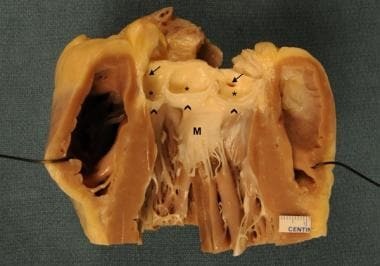 Longitudinally opened, left side of a heart showing the left ventricular outflow tract and the aortic valve. The aortic valve cusps are soft, pliable, and translucent (arrowheads). The sinuses of Valsalva (asterisks), the 2 coronary ostia, and the sinotubular junctions (arrows) are seen. M = anterior mitral leaflet, ventricular aspect. See also Aortic Stenosis, Pediatric Valvar Aortic Stenosis, Pediatric Rheumatic Heart Disease, and Pathology of Rheumatic Heart Disease. Disease processes that result in aortic valve stenosis (AVS) can be classified as congenital or acquired. The acquired group is largely consists of calcific (formerly "degenerative") and postinflammatory (or rheumatic) disease. The process of valve disease is believed to be initiated with the development of atherosclerosis along the aortic surface of the valve which, subsequent to aortic valvular osteoblast differentiation, calcifies. Early in the disease process, the thickened aortic valve is said to be sclerotic; that is, although thickening of the valves is present, there is not yet obstruction of the valve orifice. Later in the disease process, as the thickening of the valve progresses and the valve orifice becomes significantly obstructed, the valve is said to be frankly calcific. In rheumatic fever, antistreptococcal antibodies produced by B lymphocytes cross-react with host-tissue epitopes, producing inflammation in a number of organ systems, including the heart and its mitral and aortic valves. Any or all 4 valves may be involved. Inflammation induces angiogenesis in the normally avascular valve layers; over a period of months or years, thickening of the valve develops as inflamed elastic tissue becomes replaced by irregular masses of collagen fibers. Recurrent episodes of rheumatic fever produce progressive damage to the host’s valves. Rare causes of aortic valve stenosis include renal failure, familial hypercholesterolemia, Paget disease, systemic lupus erythematosus, ochronosis with alkaptonuria, and radiation. Aortic valve stenosis (AVS) is a slowly progressive disease, and not all affected patients report symptoms. The possibility that many supposedly asymptomatic individuals underreport symptoms or subconsciously reduce their activity to avoid symptoms certainly exists. The symptoms most commonly associated with aortic valve stenosis include angina pectoris, presyncope or syncope, and symptoms of heart failure, such as dyspnea. As with angina, presyncope or syncope is often induced by strenuous activity in patients suffering from aortic valve stenosis. Syncope in these individuals is believed to be induced by a drop in blood pressure, which does not occur in healthy individuals whose blood pressure rises during activity. In patients with aortic valve stenosis, total peripheral vascular resistance falls during exercise, but because of significant aortic valve stenosis, cardiac output does not rise appropriately to maintain or increase blood pressure. The subsequent fall in blood pressure produces syncope. An alternative explanation is that rising left ventricular pressures produced as the ventricle attempts to increase stroke volume during exercise trigger left ventricular baroreceptors. When stimulated, these baroreceptors induce arterial hypotension, a fall in venous return, and bradycardia. In patients with aortic valve stenosis, it is quite likely that both mechanisms described contribute to the development of presyncope and syncope during strenuous activity. Symptoms of heart failure often follow when diastolic dysfunction develops and/or the point at which increasing pressure loads overwhelm left ventricular contractile reserve, producing left ventricular systolic dysfunction. At such points, the left atrium and pulmonary venous pressures become elevated, resulting in fluid in the lungs and peripheral tissues. Rapid and accurate recognition of symptoms in patients with aortic valve stenosis is essential, as swift deterioration often ensues subsequent to symptom development. Early in the disease process the thickened or sclerotic valve does not cause significant outflow obstruction. Auscultation of this patient reveals a normal S2 or a split S2 sound, and often, a typical crescendo-decrescendo systolic ejection murmur that peaks early in systole. The murmur frequently radiates to the neck and carotid arteries and is best heard over the ascending aorta in the second right intercostal space. Due to its greater proximity to the left ventricle, the carotid pulse provides a more accurate measure of the severity of aortic valve stenosis than the peripheral pulses. As stroke volume continues to decline, the affected individual develops a weak pulse or pulsus parvus. At this point, however, the left ventricular apical impulse remains forceful. The discrepancy between a powerful apex beat and a weakened carotid pulse is good evidence of an obstruction between the left ventricle and aorta. Due to increasing calcification and stiffening of the valve cusps, the valve neither opens nor closes well. Thus, the second heart sound may not contain the aortic component. Finally, an increased dependence on atrial contraction for diastolic filling produces a prominent fourth heart sound in patients in sinus rhythm. The following conditions should also be considered when evaluating a patient with suspected aortic stenosis. Although the results of the electrocardiogram (ECG) and the chest radiograph are nonspecific, these studies may highlight features often associated with aortic valve stenosis. The ECG may show the strain pattern of lateral ST depression and T-wave inversion that marks left ventricular hypertrophy. As well, the P waves may show evidence of left atrial enlargement. Similarly, the chest radiograph may reveal a boot-shaped heart typical of concentric left ventricular hypertrophy and an enlarged left atrium. The chest radiograph may also reveal aortic valve calcification and poststenotic dilatation of the aorta. Echocardiography is the chief method for diagnosis of aortic valve stenosis. This imaging modality helps the examiner to distinguish among congenital, calcific, and postinflammatory or rheumatic valve stenosis. In the presence of significant calcification, however, distinguishing between a bicuspid and tricuspid valve is difficult, as valve opening during systole is reduced and echogenicity is increased. Rheumatic valves are distinguished by the presence of commissural fusion and, often, concomitant mitral valve involvement. In addition to revealing the degree of aortic valve stenosis, echocardiography also reveals the degree of ventricular dysfunction and the extent of hypertrophy. Altogether, the data elucidated from echocardiography influence the timing and type of intervention performed. Exercise testing in supposedly asymptomatic patients has been shown to reveal symptoms hidden by inactivity or underreporting. Stress testing in this group is important, as the development of symptoms or a drop in blood pressure on exertion is an indication for the need for aortic valve repair. [16, 18] Furthermore, when used in combination with echocardiography, exercise testing provides additional data pertaining to the severity of aortic valve stenosis. The gross features of congenital, calcific, and postinflammatory (or rheumatic) valve aortic valve stenosis (AVS) are briefly reviewed in this section. In patients with congenitally abnormal valve leaflets, and, hence, abnormal valve hemodynamics, aortic valve stenosis begins with endothelial and fibrous damage. Early thickening begins at the raphe, the primary site of calcification, and then spreads laterally into the cuspal tissues,  significantly reducing the aortic valve annulus (AVA). Again, the processes believed to be at work in calcific aortic valve stenosis are also at work here. See the following images. A surgically excised, congenitally-unicommissural aortic valve (UAV). Note the longitudinal, or exclamation-mark-shaped, orifice. The 1 commissure has been cut through by the surgeon. The 2 raphe (arrowheads) are at opposite ends. The tissue between the raphes and around them shows the greatest degree of fibrosis, thickening, and nodular calcification. The free margin is also thickened. The cuspal tissue close to the cut commissure (arrows) shows the least change (flow surface). This is an image of the nonflow surface of the unicommissural aortic valve (UAV) from the same patient as in the previous image. 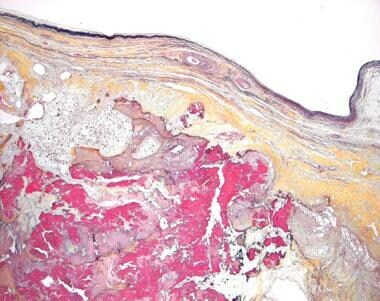 Here, too, the tissue between the raphes and around them shows the greatest degree of fibrosis, thickening, and nodular calcification. The free margin is also thickened. The cuspal tissue close to the cut commissure (arrows) shows the least change. 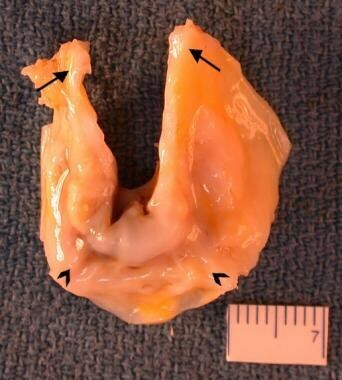 Gross image of the flow surface of a surgically-excised bicuspid aortic valve (BAV). Both leaflets show nodular calcification and calcification of the raphe ("incomplete commissure"). Although nodular, the cusp surfaces are still smooth. The flow surface shows marked calcification (asterisk) in the region of the raphe. Gross image of the nonflow surface of a surgically-excised bicuspid aortic valve (BAV). 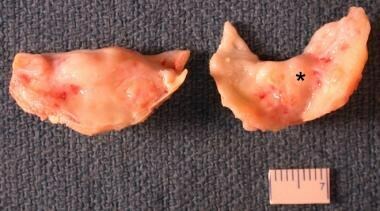 Both leaflets show nodular calcification and calcification of the raphe (arrowhead) on the sinus surface. Although the cusp surfaces are nodular, they are still smooth. In calcific aortic valve stenosis, thickening and calcification begin at the base of the cusps and progress towards the orifice,  immobilizing the cusps and narrowing the valve orifice. Fusion of the valves' commissural regions can occur, although it does not usually involve the free edge of the valve cusps or all 3 commissures. See the images below. 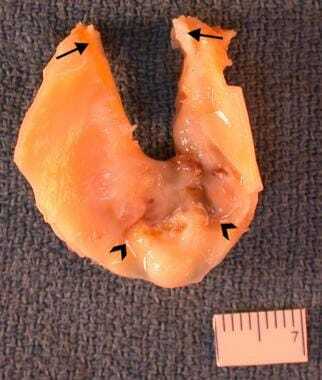 This gross image shows the flow surface of cusps from a surgically-excised tricuspid aortic valve (TAV). All the cusps show areas of patchy, mild fibrotic thickening, and focal calcification at the base (arrowhead). Adjacent portions of the cusps are still translucent. 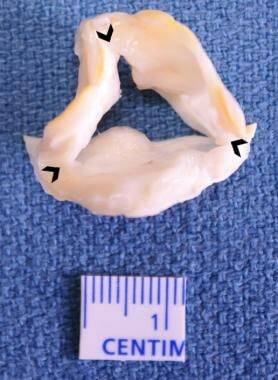 This gross image shows the nonflow surface of cusps from a surgically-excised tricuspid aortic valve (TAV). All the cusps show areas of patchy mild fibrotic thickening and focal calcification at the base (arrowheads). Adjacent portions of the cusps are still translucent. 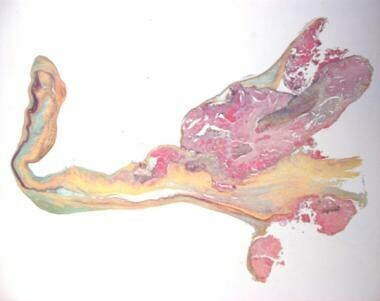 This is a gross image of the flow surface of cusps from a surgically-excised tricuspid aortic valve (TAV). 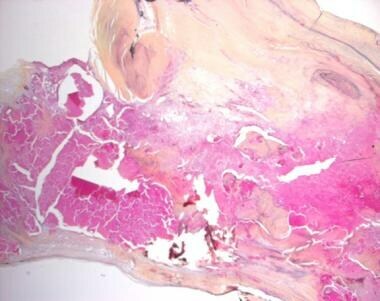 All the cusps show fibrotic thickening and nodular calcification. This is a gross image of the nonflow surface of cusps from a surgically-excised tricuspid aortic valve (TAV). 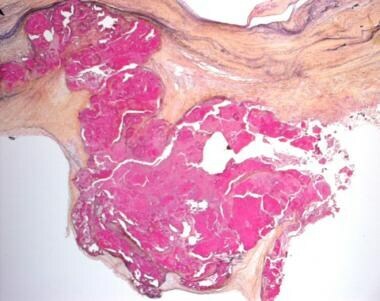 All the cusps show fibrotic thickening and nodular calcification. The inflammatory process associated with rheumatic fever produces organization, fibrosis, and retractile thickening of aortic valve cusps, as well as progressive commissural and cuspal fusion. Calcifications are found on all parts of the valve, and the surface is often covered by fibrin and platelet deposits. Maximal thickening is present at the site of the commissures, producing a triangular, severely stenosed, and often regurgitant, valve orifice. See the following images. Gross image of the flow surface of a surgically-excised, postinflammatory (most likely rheumatic) tricuspid aortic valve (TAV) showing thickening of the cusps and fusion of the commissures (arrowheads). 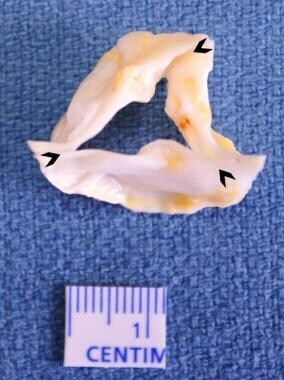 Gross image of the nonflow surface of a surgically-excised, postinflammatory (most likely rheumatic) tricuspid aortic valve (TAV) showing thickening of the cusps and fusion of the commissures (arrowheads). This section briefly discusses the microscopic features of congenital, calcific, and postinflammatory or rheumatic valve aortic valve stenosis (AVS). The histopathologic changes associated with congenital and calcific aortic valve stenosis are not different. 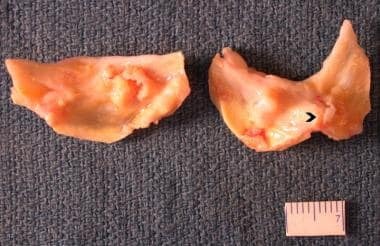 [21, 22] In both congenital and calcific aortic valve stenosis, areas of extensive fibrosis, elastosis, calcification, thickening, fat-cell infiltration, and distortion of the normal histology are present. Calcification often begins in the valvular fibrosa and gradually reaches the middle portion of the cusps without extending to the valvular edge. See the following images. 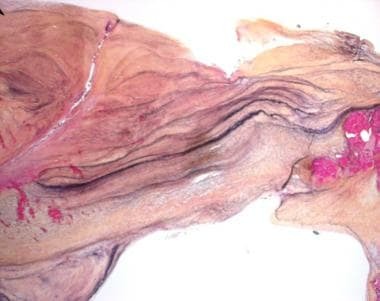 Histologic image from a surgically-excised, congenital unicommissural aortic valve (UAV) showing extensive fibrosis, elastosis, and distortion of the normal histology (Movat pentachrome stain; original magnification × 2.5). 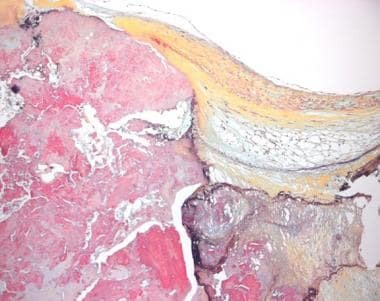 Histologic image of a surgically-excised, congenital unicommissural aortic valve (UAV) showing extensive fibrosis, elastosis, and distortion of the normal histology (Movat pentachrome stain; original magnification × 5.0). 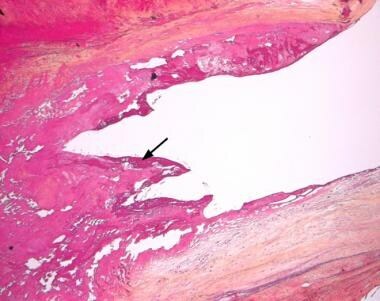 Histologic section of the raphe region of a surgically-excised, congenital unicommissural aortic valve (UAV) showing extensive fibrosis, calcification, and superficial ulceration with overlying thrombus (arrow). This image is a higher magnification of the boxed area from the previous image. (Movat pentachrome stain; original magnification × 10.0). This histologic section from a tricuspid aortic valve (TAV) shows varying degrees of change, ranging from mild fibrosis and thickening to extensive and diffuse fibrosis with fat-cell infiltration and areas of calcification. (Movat pentachrome stain; original magnification × 1.6). This histologic section from a tricuspid aortic valve (TAV) shows varying degrees of change, ranging from mild fibrosis and thickening to extensive and diffuse fibrosis with fat-cell infiltration and areas of calcification. (Movat pentachrome stain; original magnification × 2.5). Histologic examination of postinflammatory or rheumatic aortic valve tissues shows formation of new, thick-walled vessels and islets of inflammatory cells. With the exception of the fibrosa, calcifications are present throughout the tissue, as seen in the images below. Histologic section of the cusps from a surgically-excised, postinflammatory (most likely rheumatic) tricuspid aortic valve (TAV) showing fibrosis, thickening, and calcification. Neovascularization and an inflammatory infiltrate are seen. (Movat pentachrome stain; original magnification × 2.5). 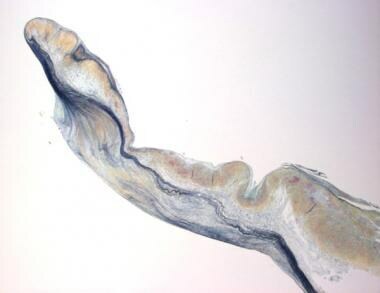 Histologic section of the cusps from a surgically-excised, post-inflammatory (most likely rheumatic) tricuspid aortic valve (TAV) showing fibrosis, thickening, and calcification. Neovascularization and an inflammatory infiltrate are seen. (Movat pentachrome stain; original magnification × 10.0). The prognosis for aortic valve stenosis (AVS) differs for treated and untreated patients. Furthermore, the prognosis is greatly influenced by the presence of comorbid conditions, the severity of the aortic valve stenosis, and the reversibility of its sequelae. In patients with severe asymptomatic aortic valve stenosis, the risk of death is < 1% per year,  and the rate of cardiac death at 5-year follow up is 19%. The rate of progression to symptoms and/or left ventricular systolic dysfunction is 4.3% per year  and changes the outlook dramatically. After the development of angina, syncope, or symptoms of heart failure, there is a high risk of sudden death, and the average survival with medical therapy is < 3 years. Without treatment, 75% of individuals die within 3 years of symptom onset. The impact of aortic valve stenosis on the quality of life is difficult to estimate. Rajamannan NM, Bonow RO, Rahimtoola SH. Calcific aortic stenosis: an update. Nat Clin Pract Cardiovasc Med. 2007 May. 4(5):254-62. [Medline]. Chambers JB. Aortic stenosis. Eur J Echocardiogr. 2009 Jan. 10(1):i11-9. [Medline]. Normand J, Loire R, Zambartas C. The anatomical aspects of adult aortic stenosis. Eur Heart J. 1988 Apr. 9 Suppl E:31-6. [Medline]. Ducharme V, Guauque-Olarte S, Gaudreault N, Pibarot P, Mathieu P, Bossé Y. NOTCH1 genetic variants in patients with tricuspid calcific aortic valve stenosis. J Heart Valve Dis. 2013 Mar. 22(2):142-9. [Medline]. Palta S, Pai AM, Gill KS, Pai RG. New insights into the progression of aortic stenosis: implications for secondary prevention. Circulation. 2000 May 30. 101(21):2497-502. [Medline]. Otto CM, Kuusisto J, Reichenbach DD, Gown AM, O'Brien KD. Characterization of the early lesion of 'degenerative' valvular aortic stenosis. Histological and immunohistochemical studies. Circulation. 1994 Aug. 90(2):844-53. [Medline]. O'Brien KD, Reichenbach DD, Marcovina SM, et al. Apolipoproteins B, (a), and E accumulate in the morphologically early lesion of 'degenerative' valvular aortic stenosis. Arterioscler Thromb Vasc Biol. 1996 Apr. 16(4):523-32. [Medline]. Lee JL, Naguwa SM, Cheema GS, Gershwin ME. Acute rheumatic fever and its consequences: a persistent threat to developing nations in the 21st century. Autoimmun Rev. 2009 Dec. 9(2):117-23. [Medline]. Kaden JJ, Eckert JP, Poerner T, et al. Prevalence of atherosclerosis of the coronary and extracranial cerebral arteries in patients undergoing aortic valve replacement for calcified stenosis. J Heart Valve Dis. 2006 Mar. 15(2):165-8. [Medline]. Gould KL, Carabello BA. Why angina in aortic stenosis with normal coronary arteriograms?. Circulation. 2003 Jul 1. 107(25):3121-3. [Medline]. Kulbertus HE. Ventricular arrhythmias, syncope and sudden death in aortic stenosis. Eur Heart J. 1988 Apr. 9 Suppl E:51-2. [Medline]. Etchells E, Bell C, Robb K. Does this patient have an abnormal systolic murmur?. JAMA. 1997 Feb 19. 277(7):564-71. [Medline]. Leach RM, McBrien DJ. Brachioradial delay: a new clinical indicator of the severity of aortic stenosis. Lancet. 1990 May 19. 335(8699):1199-201. [Medline]. Nguyen V, Cimadevilla C, Estellat C, Codogno I, Huart V, Benessiano J, et al. Haemodynamic and anatomic progression of aortic stenosis. Heart. 2015 Jun. 101 (12):943-7. [Medline]. Mehta Y, Singh R. Quantification of AS and AR. Ann Card Anaesth. 2009 Jul-Dec. 12(2):166. [Medline]. [Guideline] Bonow RO, Carabello BA, Chatterjee K, et al. 2008 focused update incorporated into the ACC/AHA 2006 guidelines for the management of patients with valvular heart disease: a report of the American College of Cardiology/American Heart Association Task Force on Practice Guidelines (Writing Committee to revise the 1998 guidelines for the management of patients with valvular heart disease). Endorsed by the Society of Cardiovascular Anesthesiologists, Society for Cardiovascular Angiography and Interventions, and Society of Thoracic Surgeons. J Am Coll Cardiol. 2008 Sep 23. 52(13):e1-142. [Medline]. Minners J, Allgeier M, Gohlke-Baerwolf C, Kienzle RP, Neumann FJ, Jander N. Inconsistencies of echocardiographic criteria for the grading of aortic valve stenosis. Eur Heart J. 2008 Apr. 29(8):1043-8. [Medline]. Ennezat PV, Marechaux S, Iung B, Chauvel C, LeJemtel TH, Pibarot P. Exercise testing and exercise stress echocardiography in asymptomatic aortic valve stenosis. Heart. 2009 Jun. 95(11):877-84. [Medline]. GORLIN R, GORLIN SG. Hydraulic formula for calculation of the area of the stenotic mitral valve, other cardiac valves, and central circulatory shunts. I. Am Heart J. 1951 Jan. 41(1):1-29. [Medline]. Gould ST, Srigunapalan S, Simmons CA, Anseth KS. Hemodynamic and cellular response feedback in calcific aortic valve disease. Circ Res. 2013 Jul 5. 113(2):186-97. [Medline]. Towler DA. Molecular and cellular aspects of calcific aortic valve disease. Circ Res. 2013 Jul 5. 113(2):198-208. [Medline]. Duncan AI, Lin J, Koch CG, Gillinov AM, Xu M, Starr NJ. The impact of gender on in-hospital mortality and morbidity after isolated aortic valve replacement. Anesth Analg. 2006 Oct. 103(4):800-8. [Medline]. Carabello BA, Paulus WJ. Aortic stenosis. Lancet. 2009 Mar 14. 373(9667):956-66. [Medline]. Quere JP, Monin JL, Levy F, et al. Influence of preoperative left ventricular contractile reserve on postoperative ejection fraction in low-gradient aortic stenosis. Circulation. 2006 Apr 11. 113(14):1738-44. [Medline]. Gerber IL, Stewart RA, Legget ME, et al. Increased plasma natriuretic peptide levels reflect symptom onset in aortic stenosis. Circulation. 2003 Apr 15. 107(14):1884-90. [Medline]. Collins MJ, Butany J, Borger MA, Strauss BH, David TE. Implications of a congenitally abnormal valve: a study of 1025 consecutively excised aortic valves. J Clin Pathol. 2008 Apr. 61(4):530-6. [Medline]. Fedak PW, Verma S, David TE, Leask RL, Weisel RD, Butany J. Clinical and pathophysiological implications of a bicuspid aortic valve. Circulation. 2002 Aug 20. 106(8):900-4. [Medline]. 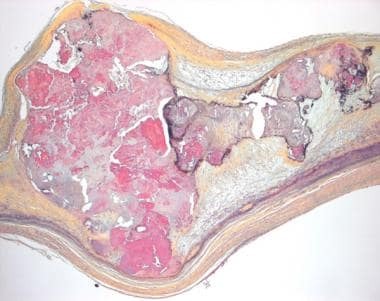 Histologic section of the raphe region of a surgically-excised, congenital unicommissural aortic valve (UAV) showing extensive fibrosis, calcification, and superficial ulceration with overlying thrombus (found within boxed area). (Movat pentachrome stain; original magnification × 2.5).